We are gathering information for the summer conference. Please fill out this survey form. It has been two years since the last survey was produced. At that time we updated information that was contained in a web-based survey created by Jane Chaffin. If you completed the survey two years ago, you will be able to edit the information you entered then, which should make this update much easier. Below you will find the web address to access two separate surveys – one for the Administrative Register and the other for the Administrative Code. Please be sure to complete both surveys. Even if you do not publish a Register or Code, please complete the first page of both surveys. 1. Each survey will take approximately 30 minutes to complete. 3. You do not have to complete the survey(s) in a single session. If you are interrupted while taking the survey or need time to find information in your files, the survey allows you to return at a later date to complete any remaining questions. Close your browser to exit the survey (it is best to finish a page and then click the “Next” button at the bottom of the page to make sure your responses are recorded). The next time you log in, you will be taken to the place you left off. 4. After you have completed the final question and clicked the “Finish” button, you can return to the survey to change any of your responses, if needed. To do this, click on the survey web address and log in. You will receive a message that says you have already taken the survey. Click the Edit icon (contains a pencil on a page) to the left of the survey creation date, and you will be allowed to edit any questions by moving through the survey using the “Next” button at the bottom of the screen. 5. CONTACT ACR VP Kerry Radcliff for your survey password, or refer to the listserve e-mail sent March 11, 2014. If you completed the survey questions two years ago, that information is still stored and just needs to be updated. You will receive a message that says you have already taken the survey. Click the Edit icon to the right of the survey creation date, and you will be allowed to edit any questions by moving through the survey using the “Next” button at the bottom of the screen. Please do not click the “Click here” button, that will create a new survey. 8. If there is someone else should respond to one or both surveys for your state, please forward this request to them and provide them with the survey URL, the username and password. Thank you for doing this! 9. Please complete the surveys by April 23, 2014. Completion by this date should give me enough time to compile the responses and have the survey printed and available at the summer conference in July. 10. A copy of the printed survey will be made available free of charge to those states that complete the survey. After April 23, 2014, online access to the survey responses will be limited to those states that have responded. If you have any questions or difficulties with the survey applications, please contact me directly. Thank you so much for your cooperation and assistance. It is with deep sorrow that I give you this news. I have tears in my eyes this morning as I have learned about the passing of our good friend Bob Colborn. A service celebrating Bob’s life will be held in Washington D.C. Those ACR members who live in the area are encouraged to attend his memorial February 7, 2014. Bob will be remembered for his big heart and big smile. How appropriate they used an ACR photo for his obit. RIP my friend. Please feel free to leave a message to his family below. Robert “Bob” J. Colborn, Jr., 77, of Cheverly, died January 23. Born March 12, 1936 in Salisbury to the late Robert J. and Marion (Tyler) Colborn, Bob was a graduate of Washington College B. S., University. of Rhode Island M.S., and University of Virginia J.D. As a member of the MSBA, he joined the Maryland Office of the Secretary of State and founded the Maryland Division of State Documents, where he served as Administrator from 1974-2001. He also founded the Administrative Code & Registers of NASS where he served as Executive Secretary and became the namesake for the annual ACR/NASS Innovation Award. As historian for the National Park Service from ’63 to ’64, he published the two reports key to the 1976 bicentennial restoration of Congress Hall in Philadelphia, and the Old Senate Chamber and Old Supreme Court Chamber of U.S. Capitol Building, Washington D.C. Bob was a gardener, a history/culture enthusiast, and enjoyed traveling. Surviving are his former wife, Marilyn B. Colborn; daughter, Amanda G. Colborn; stepson, Geoffrey (Katherine) W. Schoming; brother, George (Stacia) Colborn; sister Meg (Richard) Bond; two grandchildren, Molly and Julian; and friends, Curtis Burris, James Hughs, and Jason Amster. A service celebrating the life of Robert J. Colborn Jr. will be held 11 a.m., Friday, February 7, at All Souls Memorial Episcopal Church, 2300 Cathedral Ave., NW, Washington, DC, 20008. A reception will follow at the church. In lieu of flowers, memorial donations may be made to All Souls Memorial Episcopal Church (www.allsoulsdc.org). A further celebration is to be announced for this spring. Please be aware you many be charged long distance fees depending on your phone service. WASHINGTON, DC – Administrative Codes and Registers (ACR), a section of the National Association of Secretaries of State (NASS), awarded Utah’s Division of Administrative Rules with the 2013 Robert J. Colborn, Jr. 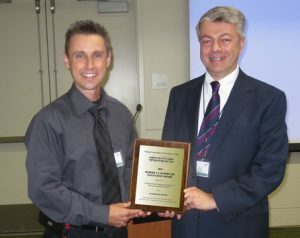 Innovation Award. Presented as part of the association’s annual meeting held on July 18-21 in Anchorage, Alaska, this year’s Colborn award recognizes Utah’s Division of Administrative Rules for its eRules system, a web-based filing and publication application. The eRules application improves access to regulatory information, the timeliness of that information, the efficiency of the process and the security of the data. ACR created the Robert J. Colborn, Jr. Innovation Award in July 2001, in honor of Robert J. Colborn, Jr., who served as the administrator of the Maryland Division of State Documents from 1974 through 2001 and founded ACR. The Colborn Award annually recognizes a program that demonstrates creativity and innovation in providing public access to, or management of, administrative rules. It honors a state agency that has made substantial contributions to the flow of information to the public by improving efficiency and delivery of services to citizens, businesses and other governmental entities. “For a generation, the State of Maryland and Bob Colborn set the high water mark for all of the states in publishing administrative rules. It is a great honor for Utah to be recognized by our peers in the other states for our efforts to improve the flow of and access to regulatory information,” said Kenneth A. Hansen, director, who accepted the award on behalf of the Utah Division of Administrative Rules. The award is not the first time that Utah has served as an innovative leader in the area of administrative rulemaking. In 1994, the state created one of the nation’s first completely electronic administrative rules filing processes. As a forerunner in establishing electronic filing, the state was selected by the Awards Committee for its on-going commitment to improve access to regulatory information while being cost-efficient and user-friendly to state agencies. For more information, visit http://www.administrativerules.org/. ACR bylaws were updated at the second business meeting in Anchorage, AK. To learn more view the minutes of the meeting posted on this site under the conference archive. A final version will be posted on this site as soon as it becomes available. Please note that the LexisNexis sponsored dinner will be at 7:30 p.m. on THURSDAY at the Hotel Captain Cook, Club Room II. Please RSVP to Brian Kennedy, LexisNexis, (434) 972-7614-o, (434) 249-0751-c e-mail Brian.Kennedy@lexisnexis.com if you haven’t already done so. LexisNexis is once again generously sponsoring a dinner at the 2013 NASS/ACR summer conference, our good friend Brian Kennedy confirmed today. We welcome LexisNexis as ACR’s first official sponsor for this conference. NASS left Thursday night open for ACR members. Dinner will be provided at a place yet to be determined by Mr. Kennedy and the Program Committee. 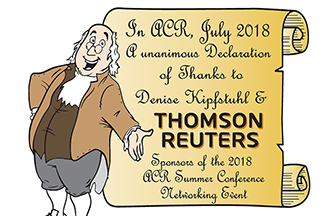 Once the time and place is determined we will be sending an invitation via the listserv to ACR members to determine how many will be attending this event. Last year LexisNexis provided dinner on Saturday, July 14 at Morton’s The Steakhouse at the Caribe Hilton, following the NASS welcome reception. We thank LexisNexis once again for its continued support of the Administrative Codes and Registers Section of NASS. Many thanks to those of you who submitted nominations already for the 2013 Robert Colborn Innovation Award. As many of you know the deadline for submitting your Colborn Award nominations was June 10th. However, after long deliberations with the other member of the Awards Committee (Elizabeth Palen (VA) – with helpful input from President Scott Cancelosi (AZ) ) we have decided to extend the deadline to Wednesday June 26th. If you are considering submitting an entry for the award please do so. The more submissions the better. Please use this opportunity to brag on yourself and your office. The forms and instructions are located on the ACR website: www.administrativerules.org, and look under the ACR Colborn Award tab at the top of the page. Let’s make this a record breaking year for submissions. You’ve been given a second chance, so please send the submissions to epalen@dls.virginia.gov. (Warning – The email listed for Elizabeth on the submission webpage is incorrect. We are working to correct this.) So, please use the email contained in this message. The awards committee looks forward to reviewing your submissions. The program committee has begun to work on this summer’s conference. We are still looking for a chair for this committee. Please see the vacancies below and let the ACR president know if you would like to participate! On July 6, 2012, Charles A. Barth was named the new Director of the Federal Register. Mr. Barth replaces Ray Mosley who retired this past winter.